It is a back focus, cone (tapered) bellows, folding bed design offered in single or double swing options. The rear standard is square allowing the removable back to be reversed for landscape and portrait orientations. As a note, the revolving back version of this camera was available as Flammang's Patent Revolving Back Camera (rear focusing pattern). 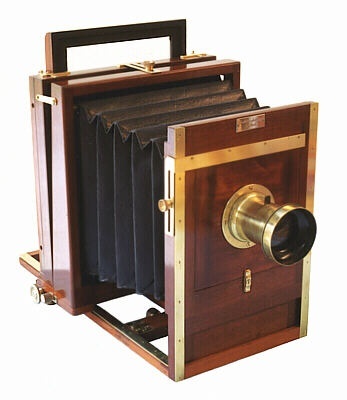 The camera body is mahogany mounted on a cherry base with brass hardware. It was advertised as being portable and offered in formats ranging from 4-1/2 x 5-1/2 to 20 x 24 inches. This example is an 8 x 10 inch model with the double swing option, geared fine focusing, and Euryscop IV No.3 lens. The nickel plated maker's label is marked "Scovill Manufacturing Company, NY" implying a manufacturing date in the 1880s. The Reversible Back Acme View Box was advertised for $34 in the 1888 W.D. Gatchel catalogue. This camera would cost about $645 in year 2000 dollars.